Born in London, of Huguenot descent, he worked as an architectural sculptor and brick and wood carver in New Inn Yard, Tottenham Court Road, London, from 1880, assisted by his sons, William and Percy Aumonier. Their commissions included the terracotta sculpture and ornament on the New Victoria Law Courts, Birmingham (1886) and Bath Municipal Buildings (1891). They also executed wood carving for the steamships Austral and Ophir. 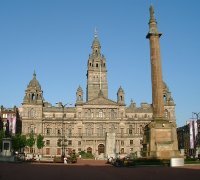 In Glasgow, he was one of a host of sculptors engaged to execute some of the carver work on the City Chambers (1882-90) although no records exist of what work he actually did. Aumonier's firm was continued after his death by his sons and grandsons, Eric (1899-1974) and Whitworth, as W. Aumonier & Sons. Their output included figurative sculpture and reliefs for the London Underground, Daily Express and Norwich Town Hall, with Eric Aumonier as their principal sculptor. RIBA Journal [Obit], 14 February, 1914.